Nutra-Nuggets Maintenance Formula, for adult dogs with normal levels of physical activity and performance dogs during periods of rest, is designed to help meet nutritional demands while helping to maintain a healthy weight. The superior digestibility of high-quality chicken, chicken fat and carbohydrates, together with optimal levels of metabolic energy, means you can provide all the necessary energy your dog requires while feeding smaller quantities. Chicken meal, brewers dried rice, barley, maize, rice bran, chicken fat, dried plain beet pulp, chicken digest, egg derivatives, fish meal, linseed, glucosamine hydrochloride (0.03%) and chondroitin sulphate (0.01%). 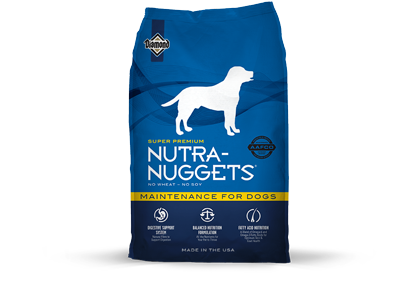 Nutra-Nuggets Maintenance Formula for Dogs is formulated to meet the nutritional levels established by the AAFCO Dog Food Nutrient Profiles for maintenance.